Stephanie Lynch, Clinical Nurse Specialist, Assistive Technology, Daughters of Charity, St Vincent’s Centre describes the IT amenities for those with an intellectual disability. Blanchardstown Library, the largest Public Library in Ireland, is situated opposite Dublin’s Blanchardstown Shopping Centre, beside the Draoícht Theatre and on a busy bus route. The Cyberskills room in the library is a large accessible custom-built ICT training facility for local community groups. Funding for this facility was made possible by a grant from the “eInclusion Fund” which was available a few years ago, administered by the Department of the Taoiseach. The fund was set up to facilitate the greater use of ICT and the internet by groups experiencing difficulties in this area—including people with intellectual difficulties, older people, women working in the home and men working in traditional trades. At the initial setup stage, Librarian Lillian Whelan, who made the application for the funding, contacted staff from our Client Computer Service at St Vincent’s Centre for advice on software and hardware accessible for users with an intellectual disability. Lillian included our recommendations in the funding application and it was successful. Along with the twenty training computers in the Cyberskills room, there are four dedicated computers with assistive technology resources.These computers are accessible to users who have an intellectual disability. Each computer is positioned on an adjustable-height table to facilitate wheelchair users; they have a selection of special-needs software installed with a number of alternative input devices attached to facilitate access; and all have internet access. ■ Software is easy to launch and navigate. ■ Graphics are visually simple, clear, uncluttered and free of busy and rapidly changing screens. ■ Language is clear and simple. ■ Tasks are easily understood with the ability to select or deselect specific tasks. ■ Some of the software provides the user with an age-appropriate real ‘life skills’ environment. ■ All the software supports alternative input devices. ■ The software includes options that allow configuration and design for individual needs. ■ Individual configurations are easily saved and retrieved. ■ Different levels of difficulty can be set to challenge, but not frustrate, the user. ■ Software allows changes in its content and how it is presented. Using a standard mouse or keyboard requires a combination of motor, cognitive and physical skills that can be a challenge to many users. They require an input device that is appropriate to their cognitive and physical skills. Each computer has a variety of input devices available and all have a touch monitor which provides the most direct form of access to interact with software. 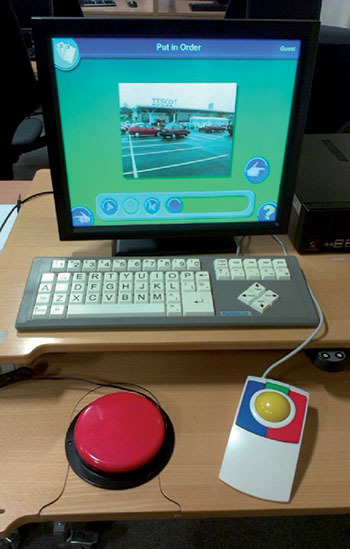 Alternatives to the standard mouse are available, such as a trackerball, which has a large sturdy ball that can be moved using the whole hand and three large coloured buttons which, when pressed, perform the same actions as a standard mouse. There are alternative keyboards available in different layouts and sizes. Some have lowercase letters which can help with letter recognition; others have larger keypads which are easier to focus on and easier for users to isolate individual keys. Switches are also available as an alternative to the standard mouse and keyboard. They provide a direct and simple method of access to engaging and motivating computer activities, and they are connected to the computer using a switch interface. With the implementation of the New directions report (Health Service Executive 2012), day service users are moving from St Vincent’s centre-based day services to inclusive community-based services. There are now several community-based day activity groups using the accessible ICT facilities in the library Cyberskills room. As individual users have different abilities, interests and learning styles, the purpose of the sessions vary. It may include the development of new ICT skills, practising and consolidating previous learned skills. For others it is an accessible activity that they enjoy. I continue to provide support and advice to users and staff availing of the resources in the Cyberskills room in Blanchardstown Library. It is a great accessible community resource. Sessions are booked in advance and it is possible to block-book during regular library opening hours. Contact Fergus.oreilly@fingal.ie, Blanchardstown Library, Civic Centre, Blanchardstown Centre, Fingal, Dublin 15.